All of a sudden the garden is in full bloom and all the flower shows are taking place , this week it is RHS Hampton Court Palace providing inspiration. I love a botanical print and quite often find them in charity shops or even some free postcards at one of the horticultural events. Pinks and purples of fragrant sweet peas or tea roses intermingled with cool and fresh greens of ferns or herbs but how can this be used in home decor? Bring a few flowers and greenery in out of the garden, place in vases or jars. My allotment plot neighbour has told me to cut as many as his sweet peas as I like as the more you cut, the more flowers you get. The smell is divine and fills the room. I do like having cut flowers on the mantlepiece or on the dresser as it gives a very seasonal look. 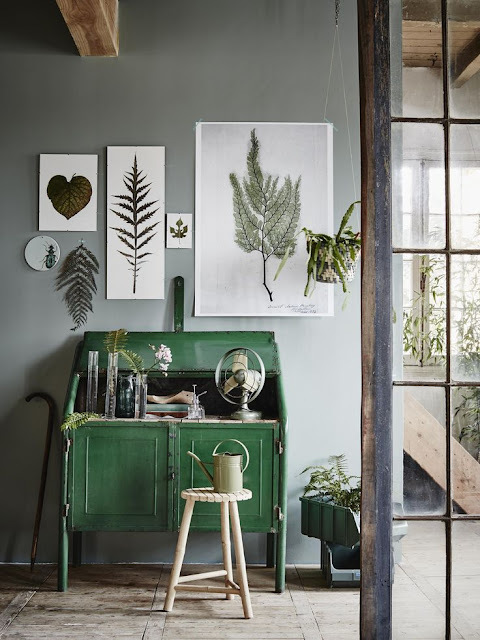 Add pot plants like ferns, on a book shelf or be inventive and add violets to old vintage china tea cups or have tiny air plants suspended in glass balls. It doesn't have to be all full on though, how about a minimalist botanical feel? 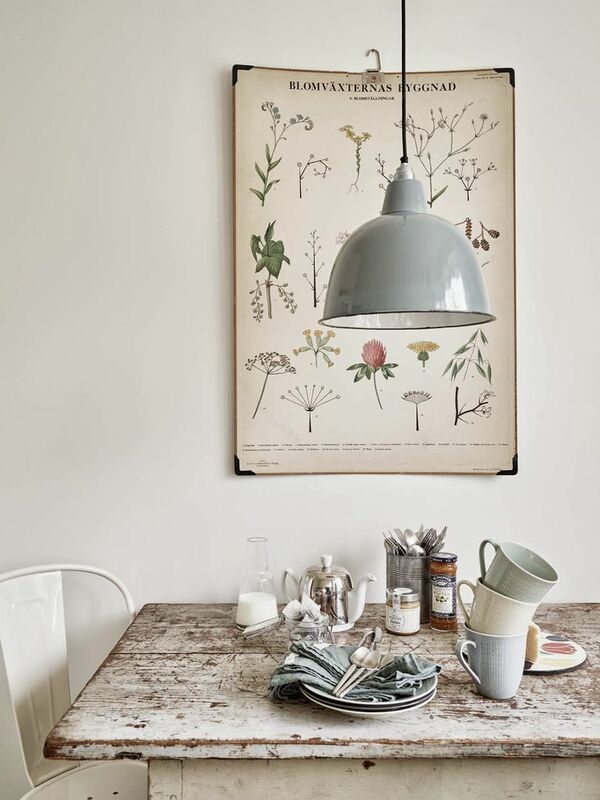 Just one plant or one vintage print can bring a natural feel to a room, think about adding a lamp that highlights the artwork or a ceiling light inspired by flora. There is a great range of lighting styles available out there to look through or perhaps have flower fairy lights or candles for a soft glow. With so many different types of paint on the market, look for a shade reminiscent of a favourite plant of flower and paint up a piece of furniture in a botanical shade. I love colour and like painting up old tables or chairs in shades of pink or green. Match your favourite flower down at the paint centre for a hue special to you. Make a gallery display of botanical prints. As mentioned previously, you can pick these up relatively cheaply and create a eclectic arrangement. An idea I love is using transparent frames and putting natural items in them. You can even make your own botanical prints using the free downloads from the Botanicus. Printers tray collections of nature finds add an element of curiosity and will certainly be a talking point. For a bolder statement, bold floral print wallpaper on a single wall or go for a more subdued paler tone. If I were brave enough I'd have a tropical feel to a room with greens, corals and bright pinks that remind me of sunnier climes. Mix with fauna. Accessorize with seashells, fossils or museum style prints of insects. Faux stag's horns, bird print cushions and wildlife inspired homewares. 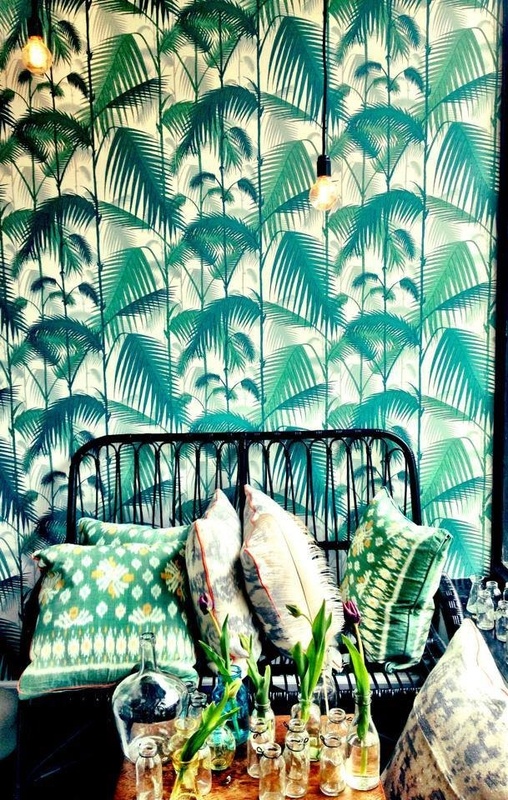 Do you have botanical themes in the home? I'd love to hear of any great ideas of displaying plants and flowers in the home.